GREEN LIGHT: Adult fitness equipment at a cost of $80,000 is set to be installed at Little Shoal Bay. Adult fitness equipment for Little Shoal Bay costing $80,000 is creating controversy. The Kaipatiki Local Board voted five to three in favour of it at their April 11 meeting. But the Northcote Residents Association, the Birkenhead Residents Association and the Little Shoal Bay Protection Society all want the board to reverse its decision. 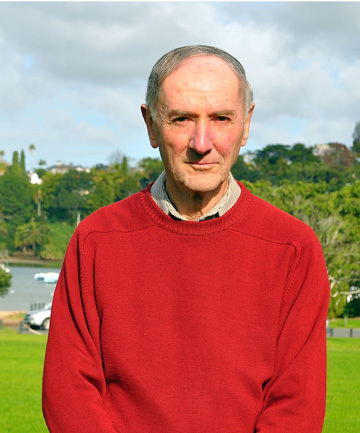 Northcote Residents Association chairman Brian Plimmer says the “cash-strapped” board has found $80,000 for a project which no resident has asked for, while projects which the community have requested, some for a long time, cannot be funded. Birkenhead Residents Association committee member Carol Scott says the association is concerned at the large sum allocated to the project that has not been generated by public demand and the encroachment into the green open space of the reserve. Little Shoal Bay Protection Society chairman Tony Holman believes the proposal was at the outset “internally generated”‘ and not the result of public demand. Community consultation on the proposal showed 62.77 per cent of people were in support of the project at the proposed location and 37.23 per cent were against it. Mr Holman says the society carried out its own survey over the same areas covered by the board’s survey and its results showed 96 per cent against the proposed site and 85 per cent totally against the proposal proceeding at all. Several people also spoke in favour of the proposal at the meeting’s public forum including Grandparents Raising Grandchildren Trust member support manager Di Vivian. She says there is a great need for them to be able to access these spaces and places, both for their own good and the good of their grandchildren. Kaipatiki Local Board chairwoman Lindsay Waugh says it isn’t an “unasked for project” and there is a lot of community support for the project including some very long-term residents. Northcote MP Jonathan Coleman criticised spending on the equipment saying most people in the relatively affluent neighbourhood go to gyms. But Ms Waugh says that was a big assumption. Not everyone can afford gym memberships and it’s about the wider community and their different needss. Shoal Bay reserve gym gear not the right fit? A group that has worked for decades to preserve Little Shoal Bay in Northcote is furious at a decision by the Kaipatiki Local Board. Tony Holman, chairman of Little Shoal Bay Preservation Society, claims the board acted unconstitutionally by voting last week to install adult outdoor exercise equipment worth $80,000 on grass beside Council Tce. Mr Holman says the 1997 Little Shoal Bay/Le Roys Bush Reserves management plan states the grassy reserve is to be used for open, passive recreation and that the area is to be protected for “its unique environmental landscape”. He says the plan was formed after extensive public consultation and the board is riding roughshod over that process. As a former North Shore City councillor and chair of its parks committee, he believes he knows the situation well. She says the location was recommended by parks officers because it is on a popular walking route. “Support and demand … came from a number of sources in the community,” says Mrs Waugh. 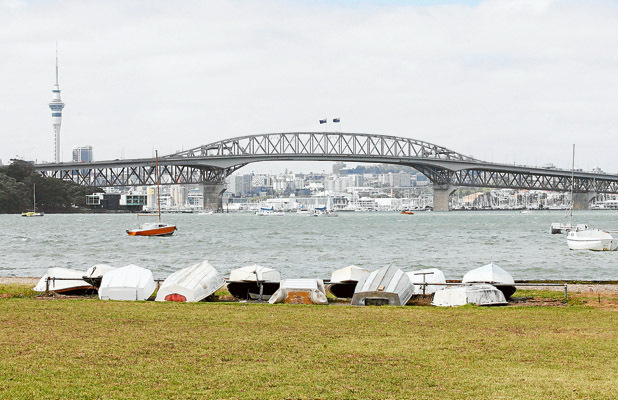 “It was brought to the attention of the Birkenhead/Northcote Community Board by the community co-ordinators several years ago, because it responded to the [former] North Shore City Council’s Auckland Regional Physical Activity Strategy. The board used a discretionary fund pool for this and equipment in five other parks. Mr Holman says the plan clearly says no buildings should be erected where the equipment is planned. The board did acknowledge that the equipment is not specifically permitted in the management plan “as this is 15 years old and the demand for outdoor fitness equipment is relatively new. “[But] … it is not precluded under the objectives and policies of the plan. Consideration has been given to the relevant policies and objectives of the plan whilst choosing the location for the equipment to minimise its potential impacts,” the summary said. Mr Holman says a better site would be across the road between the tennis courts, toilets and bowling club, on an under-used carpark. She says the board delivered 255 questionnaires to the community and said 37 per cent opposed the equipment from the 36 per cent returned. Mr Holman’s society also surveyed locals and its results contrast with the board’s. Largely the same area was surveyed, with an 84 per cent negative response from the 26 per cent of people who returned the 300 questionnaires. Mr Holman says his group shouldn’t have to ensure decisions are made that protect the bay. Areas needing attention include drainage from the reserve’s higher part to the flood-prone lower area, and the poorly designed sand wall which causes sand in the bay to be washed out to sea. Mrs Waugh says the board’s long-term plan includes advocating for resanding and mangrove management at both Tui Beach [Beach Haven] and Little Shoal Bay. She also takes issue with comments by local MP Jonathan Coleman that the area’s affluent residents can afford gym memberships and therefore do not want the equipment. “That assumes the park is for the exclusive use of those who are fortunate enough to live next door,” she says, adding the community has given “wholehearted support for this initiative”. That doesn’t sit well with Mr Holman who insists the site is wrong. “I believe the board’s decision is unconstitutional. They will say it’s only a minor thing, but it’s not minor to be putting active stuff in part of the park labelled for passive recreation and open space. The largely unused car park where Tony Holman thinks the equipment would be better suited. For almost 31 years Northcote resident Tony Sharrock has been cleaning up what was once a run-down beach. “As a little boy in the 1950s it was a run-down beach, now it serves up to 70,000 people,” he says of Little Shoal Bay. Before it got cleaned up a lot less people would visit Northcote’s only beach. On Sunday, November 1, he will again be preparing the beach for summer, as he has done each year since 1978, he says. He is joined by Birkenhead and Northcote Pt residents, though a North Shore Times article last year also drew residents from Takapuna and Devonport, he says. “We want it to be a better place for the whole of Auckland. Run by Northcote Residents’Association, the event is now supported by the Auckland Regional Council Eco Project, and the ARC are providing sausages for a barbecue for volunteers on the day. Fellow supporter Northcote Tavern is also providing drinks for volunteers. Children are encouraged to take part and participants must wear sturdy shoes and hats, while gloves and bags are provided. The clean-up is on at 2pm to 4pm on Sunday, November 1, meeting at Sea Scout Hut and Halls Beach Changing Shed. For inquiries contact Mr Sharrock on 419-7430 or 021-708-274. Many of us find working in the bush a very rewarding way to learn more about our native environment, to enjoy working in the open air and to return something to our local community. FAST-TRACKED: Replacing sand at Little Shoal Bay, pictured, and Halls Beach will cost $1.5m. Up to $14 million of ratepayer money will be “frittered away” on parochial projects in a panicked spend-up before the supercity arrives, says Shore councillor Chris Darby. Councillors outside the mayor’s so-called A-team challenged the spending plans for money from the sale of former council works department land in Albany. Mayor Andrew Willliams says the money will go to “legacy community projects” that will benefit all Shore residents. “Choosing between risking the survival of many of these long-planned community projects under the new Auckland Council or disposing of the old works site to guarantee their completion was an easy choice to make,” says Mr Williams. Councillors Ann Hartley and Chris Darby say the process was based on political whims rather than proper analysis. It’s not the way to run a $4 billion to $5 billion business. It’s panic stations,” says Mr Darby. Mrs Hartley says the mayor threw her out of a debate in confidential on the issue after she challenged the selection process. Just over $4m is being spent on three projects that shouldn’t be on the list, she says. Instead, the council left off vital spending on air conditioning and insulation at the North Shore Events Centre which is used by 300 children for basketball alone, she says. 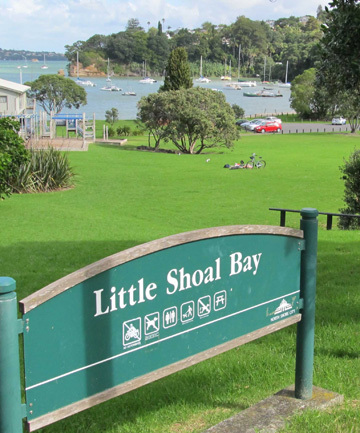 Resanding Little Shoal Bay and Halls Beach isn’t a priority and the Auckland Regional Council is challenging the worth of similar projects, Mrs Hartley says. Money to buy land to protect bush isn’t a priority project either because there are hundreds of opportunities but the council struggles to care for existing reserves, she says. A council contribution towards the Takapuna exhibition centre is a drop in the bucket because $9m needs to be raised, says Mrs Hartley. Mr Williams says Mrs Hartley, a former mayor, Northcote MP and deputy speaker in Parliament, was being disruptive and ignored rulings from him as mayor. Mr Williams says there “has been a full process that commenced on October 20, 2009, and all councillors had the choice to do their best for the city and their communities”. He says it’s common for councillors who lose the vote to claim due process wasn’t followed to revisit decisions or claim an initiative is a pet project “until their favoured initiative arrives on the council agenda”. Strategy and finance committee chairman Grant Gillon says some councillors didn’t attend meetings where they could have put projects forward and complained afterwards. It would be hard to describe it as a spending spree because projects had to be already in train, says Mr Gillon. Bringing the projects forward and paying cash will reduce debt and interest payments in the future. The council is due to seek tenders for the former works department land soon. The Auckland Transition Agency has approved the sale. Mr Williams says the agency agrees in principle with the project list as long as they are cost neutral. They were presented for formal approval on Wednesday. Purchase of some reserve land for bush protection $1.2m. FISH DUTY: Northcote College teacher Kit Hustler is monitoring the Little Shoal Bay stream for fish in his spare time. Kit Hustler is passionate about Little Shoal Bay. He has been monitoring fish in the Little Shoal Bay stream since August last year. The Northcote College teacher says they have a nice stream on their doorstep and the project is about finding out what’s going on in it. So he set about monitoring the stream with several of his students. Some of them have now left the college but continue to help in their spare time. They have been catching fish, weighing and photographing them before returning them to the water. But Mr Hustler says the more they do, the less they know. He has discovered there are about six species of fish in the stream with the largest measuring about 22cm long. He believes the fact they’re surviving in the stream is a testament to how well people in the area are treating the water. 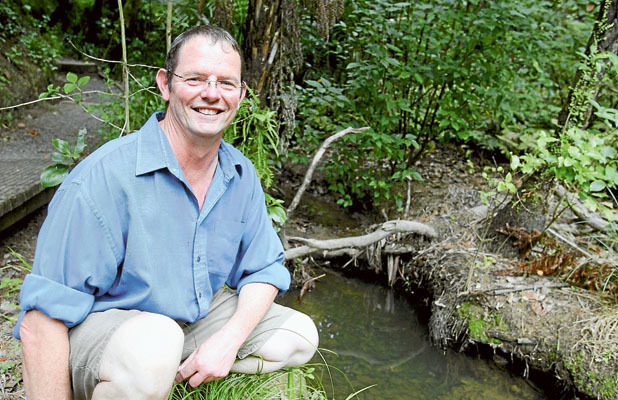 Mr Hustler has been studying the impact gambusia – mosquito fish – have on other fish and is trying to discover if there is a pattern to which types of fish are located in particular parts of the stream. They are also using temperature probes to assess any changes in water temperature. Mr Hustler has been teaching at Northcote College for nine years and says it’s great to have a “lab” on the doorstep. He says the plan is to get more kids involved because the project is a real biology lesson. “That’s the attraction, we don’t actually know the answers,” he says.